This Sweet Potato Cheesecake combines 4 layers of deliciousness: a base of homemade pound cake, then a layer of wholesome Georgia sweet potato pie, followed by a layer of New York Style Cheesecake and last but not least a layer of creme fraiche. What you get is 3 desserts in one, imagine serving that to your guests. 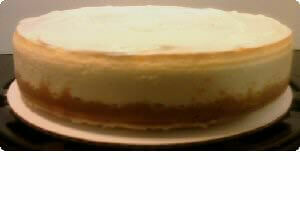 It is a 9-inch cheesecake that serves 8-10 people. The Sweet Potato Cheesecake is handmade, freshly baked specifically for your order and will ship 2 business days after your order is placed. It will be shipped directly from the baker in its own thickly insulated shipping box, packed with dry ice, and will incur a separate shipping charge. Ingredients:cream cheese (pasteurized non-fat milk and milk fat, cheese culture, salt, stabilizers [xanthan and/or carob bean and/or guar gums]), sugar, eggs, sour cream (cultured pasteurized grade A milk and cream, enzymes), fresh lemon juice, vanilla (vanilla bean extractives in water and alcohol [41%]). Sweet potatoes, butter (cream, natural flavoring, brown sugar (sugar, cane syrups), sugar, evaporated milk (nonfat milk, contains 0.5% or less of: dipotassium phosphate, vitamin A palmitate, vitamin D3), eggs, nutmeg, cinnamon, vanilla (vanilla bean extractives in water and alcohol [41%]), pound cake: butter (cream, natural flavoring, contains milk) , cake flour (enriched bleached flour [wheat flour, niacin, reduced iron, thiamin mononitrate, riboflavin, folic acid] contains wheat ingredients), sugar, eggs, milk (pasteurized homogenized milk and vitamin d3), vanilla (vanilla bean extractives in water and alcohol [41%]), baking powder (cornstarch, sodium bicarbonate, sodium aluminum sulfate, monocalcium phosphate), salt (calcium silicate, dextrose, potassium iodide).